It never seems like fall has begun, at least in my eyes, until JIBRI puts out her collection. As soon as it comes out, I can see the leaves turn to orange, that crisp breeze in the air, and I can hear the pitter patter of children's feet rushing door to door in their costumes for candy. I see it, don't you? This year JIBRI has brought the freshest and most vibrant colors out for the season. And above all else, my most coveted favorite, winter white. 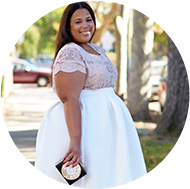 I love winter white during the colder months, but as a fan of it I do know how hard it is to come by that perfect piece in plus sizes. JIBRI just sliced through the hard times with not one, not two, but what looks like 5 pieces. Well put that in your pipe and smoke it! My mouth also got wet, yes I said wet, with this jumpsuit in the (what I assume to be) tie dye army green. Oh yes sweet baby Jesus! I'll take it. What do you think? You can see the whole collection here. I'm feeling that green monochrome look!!! Yes! Love the winter white and the Green for the Holidays. Thanks. I'm loving the green outfits! Love the last one but I can't ever pull off white pants as much as I want to. It seems no matter where I buy them, they're see through and just not plain not good. I know!!!!!!!!!!!!! I have tried for years!! It's not a forgiving fabric -- I have cellulite issues, so I understand. I would try and buy them every year and every year I would fail!!!!!! I am in love with the first one, the cream crop top and full skirt! That highwaist tartan skirt is something dreams are made of!